← Beer Review Blast! : What have I been drinking lately? Since the day I was born I’ve been living a life steeped in traditions, all of which have given me a sense of purpose and enriched my quality of life. So when it came to brewing and naming my first all grain hefeweizen, a classic german beer style; the importance of remaining true to one’s traditions came to mind. It brought back memories of watching Fiddler on the Roof with my mother for the first time as a child and her telling me that her mother introduced her to it. Hence, I’ve named this beer Tradition, Tradition! Hefeweizen. Beyond tackling the brewing of my first hefeweizen I also took it upon myself to brew my first ever 8 gallon batch of beer. As mentioned in the above video, my biggest obstacle in doing so was not having the ability to take an accurate preboil gravity reading due to my brew kettle’s 10 gallon capacity. The next obstacle was having to use multiple pots to boil the 11 gallons of preboil wort on my stove. After blending the wort to keep things as uniform as possible and increase hop utilization, I poured 8 gallons into my main kettle, 2 gallons into a 12 quart stock pot and 1 gallon into an 8 quart stock pot. One small boil over aside, after the two larger pots reached a boil I realized that the 8 quart pot which was on my stove’s smaller “simmer burner” wasn’t able to maintain a boil. Therefore, I decided to keep it on its burner and gradually add its wort into the 12 quart pot. I should also note that I created three recipe files for this brew day on Beer Smith; a 5 gallon batch, a 3 gallon batch, and an 8 gallon combined batch. Doing so helped me figure out how to tailor my hop* addition schedule to the size of each boil (13-14 IBUs). After both boils were over I combined both pots/kettles and estimated how much wort I ended up with. It was my estimation that caused me to miss my target OG by 2-3 points. Don’t worry, I’ll explain…The combined wort’s gravity was 1.060 or 6 points over my target of 1.054. So I went into BeerSmith’s dilution tool and at my estimated 8.75 gallons and target OG of 1.o54 I calculated that I needed to add 0.85 of a gallon to my kettle. However, after doing so and taking another gravity I was left with a gravity of 1.052. While I’m okay with that OG, I’m glad that the new kettle that I ordered recently has volume markings etched into it i.e. no more need for blind estimates. Due to the added volume of the top up water I ended up with roughly 8.6 gallons of wort split between two Better Bottle carboys; 5 gallons in a 6 gallon, and 3.6 in a 5 gallon. For a glimpse into the start of fermentation watch the video above. Overall, I am happy with how brew day went and am looking forward to the finished products. *All hops used were provided by Yakima Valley Hops for the purpose of hop education and review through brewing. Mash Schedule: My original goal was to do a ferulic acid rest, but after a late start to brew day and overshooting my initial mash temp I decided to stick with a protein rest followed by a sacc. rest, a mash out rest, and fly sparging. June New York City Homebrewers Guild meeting: I discuss the formal portion of the meeting where we played “Guess the hop” and then the subsequent bottle share where was I lucky to try the NHC 2015 Best of Show gueuze which was brewed by 3 of my fellow club members. 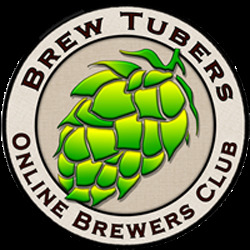 June Brewminaries club meeting @ Threes Brewing: I discuss the fast growth of the club since its inception in March of this year and how great it was to hold the meeting at Threes Brewing, a fairly new NYC brewery in Brooklyn. 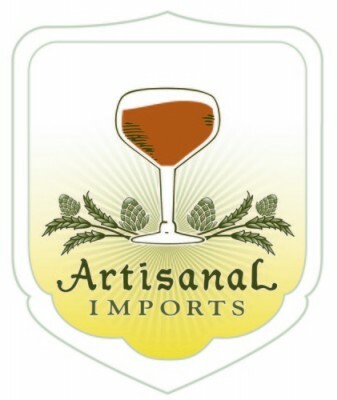 Update on my Tart Tense saison (fermenting w/ The Yeast Bay’s Farmhouse Sour Ale blend): An update on the beer’s fermentation with a gravity sample that I took at the 15 day mark. 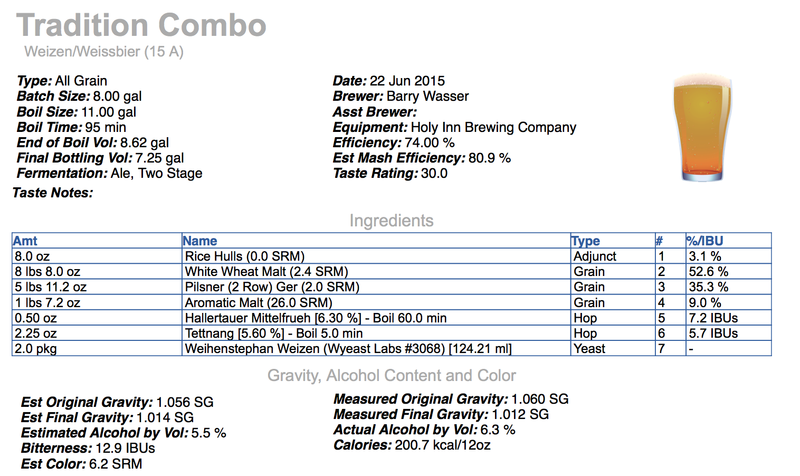 Wrap Up: A brief discussion of what’s coming up in terms of my homebrewing. Cheers and Keep on brewing! This entry was posted in Uncategorized and tagged all grain hefeweizen, fermentation temperature control, NHC 2015 winners, NYCHG, protein rest, step mash, swamp cooler method, Threes Brewing, Wyeast 3068, yakima valley hops. Bookmark the permalink.